Part 2 The Return of the VB ISE! 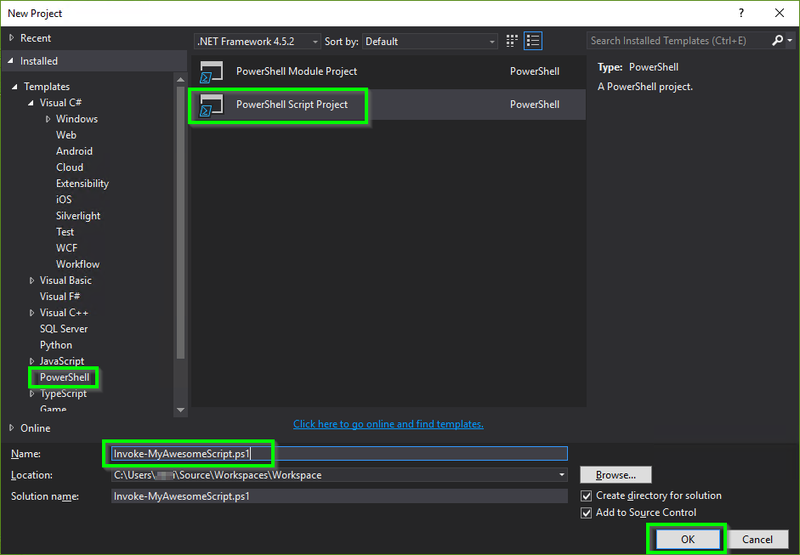 This is a continuation of my adventures into moving to Visual Studio from the Powershell ISE you can find Part1 over here, go read that if you havent to get all caught up. 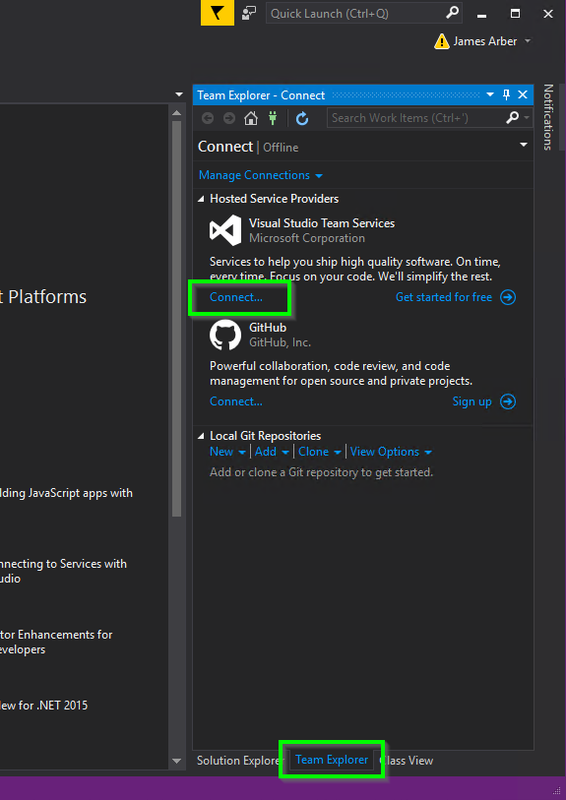 Right, When we left off we had just installed Visual Studio, Connected it with Visual Studio Team Services and created our first Project on the Visual Studio Team services site. That’s all fine and good, but what about actually using it? Well that’s simple enough. In this part we are going to go over Repo/Workspace management. 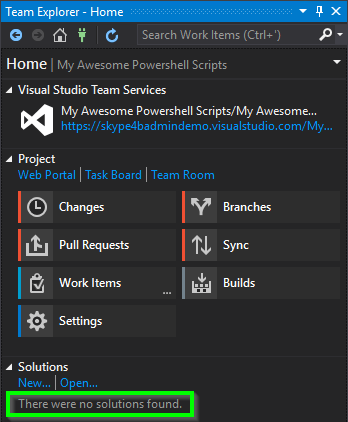 Visual Studio will now connect to Visual Studio Team Services and show a list of Projects and Teams your account is associated with. This can take some time to connect and populate so be patient. 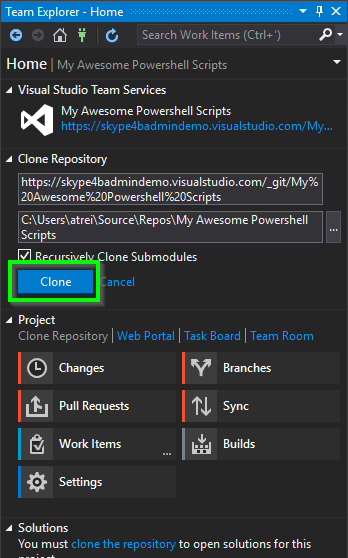 Visual Studio will prompt you to “Clone” the repo, This downloads the code (which doesn’t exist yet) to your local machine for you to edit. 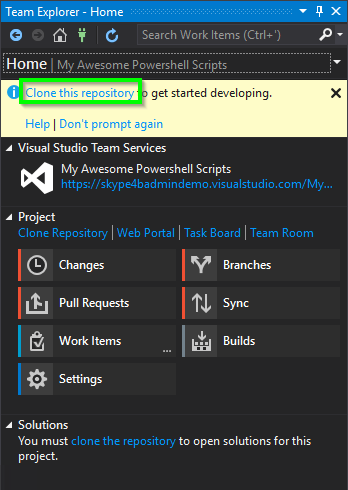 Visual Studio will clone the repository for you, however as we haven’t defined a Solution yet, it will show no solutions. These will be explained in more detail later, but if they haven’t appeared something might be wrong. Click on “New…” under Solutions. 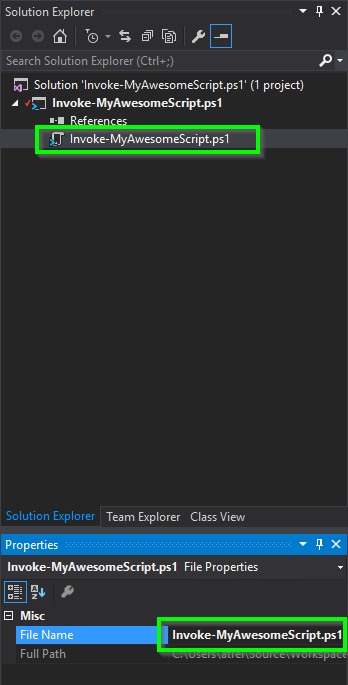 Now Visual Studio is going to ask you some questions about the project. 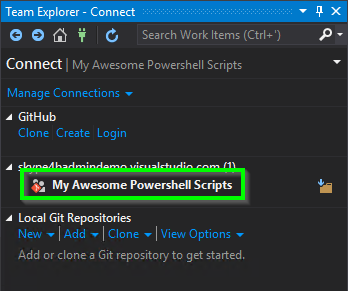 Select PowerShell in the left pane and make sure you click “Powershell Script Project” in the middle pane. You will be dropped into the ISE ready to go. Note that the “Solution” has been added to your local repo. 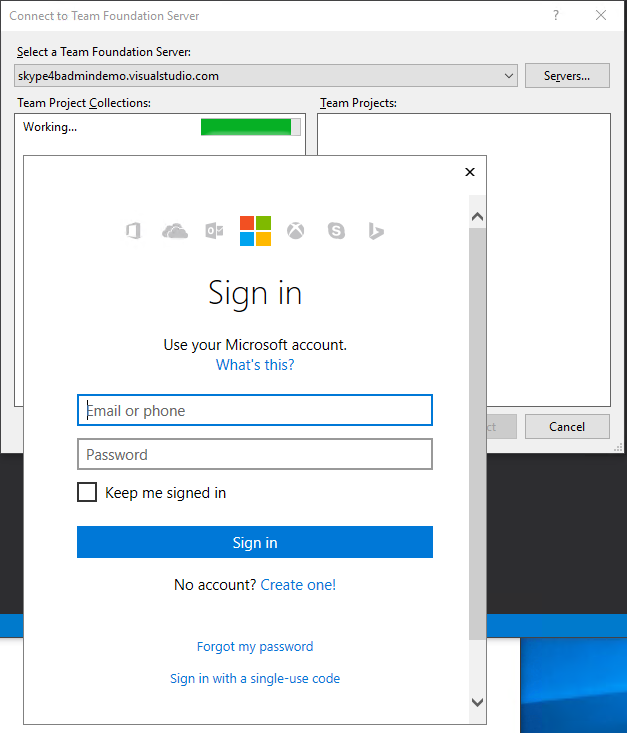 For anyone that’s used a Microsoft development ISE before, this layout is going to be very familiar. 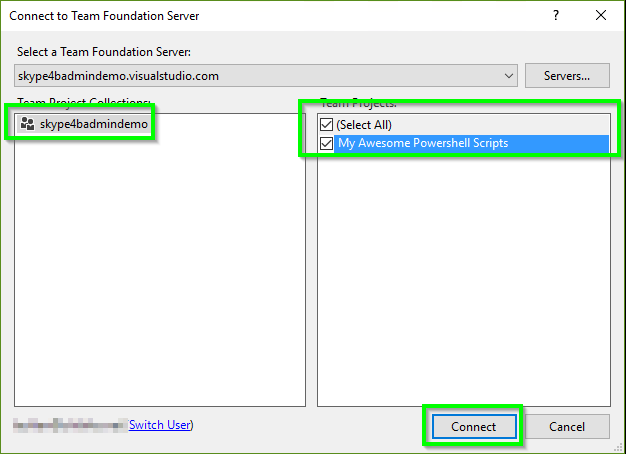 Heck I learned in VB5 and the interface still follows the same principles. Code on the left, Objects on the right, with Object properties underneath. 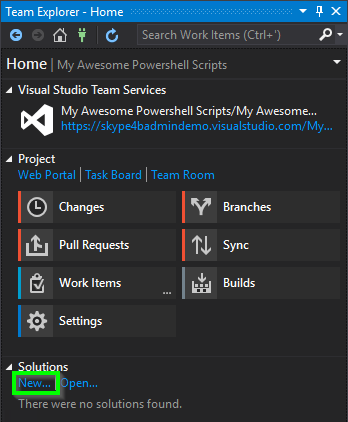 As were now working with the script, and not the version control or repo systems, lets switch over to the “Solution Explorer” tab in the Object Navigation section. 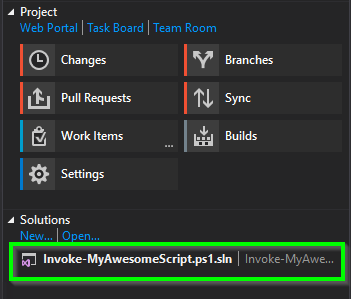 You can store all sorts of stuff that’s relevant to the project in this folder and reference/edit them in visual studio. Click on the Script1.ps1 object and the properties area will update to show the actual scripts properties, but as it’s a PowerShell script there isn’t a lot here. 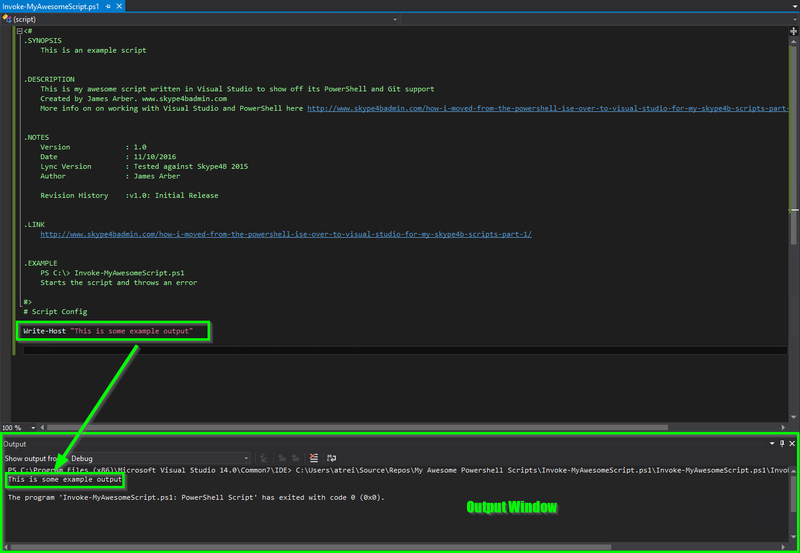 Now update the File Name property and you will see the object automatically update in Solution Explorer. 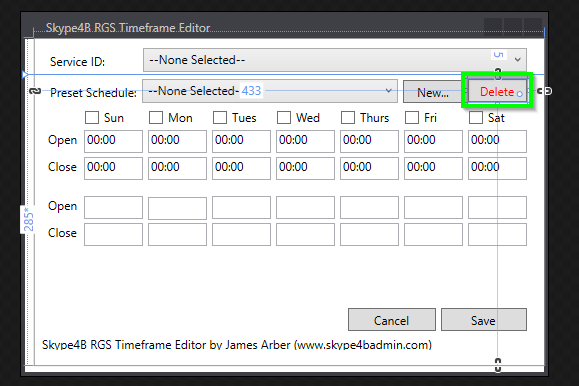 This will all make sense later as we get into the GUI Stuff..
Now that we have set the properties correctly, we can add some code in the main window. If you want to play along, here’s my code. 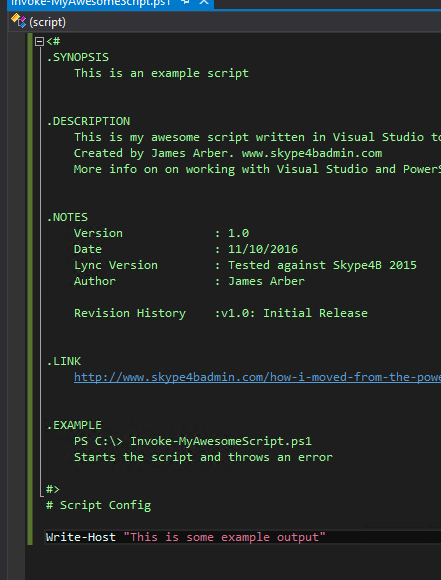 We can now save and test this script. Note the Yellow bar on the left has turned Green? This is to show you code you have worked on this session. 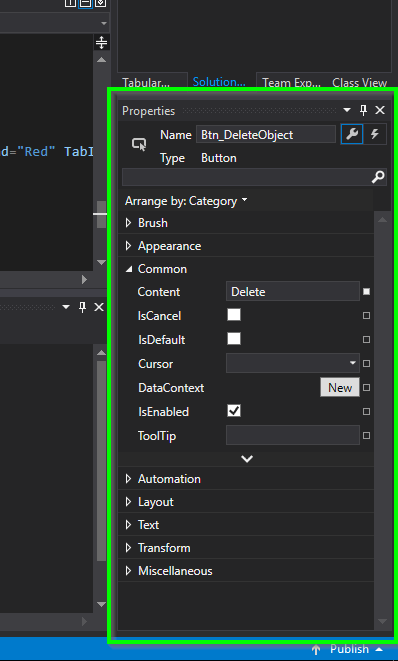 Yellow is unsaved changes, Green is new/changed code this session. Okay, so we have made a project, added some code and saved it. 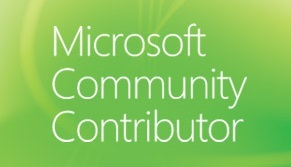 How does version control come in? Check out Part3 for more info.